Costa L.F, Lains P, Miranda S.M (2016) "An Economic History of Portugal, 1143-2010", Cambridge University Press . Link . Freire D, Lains P (eds.) (2016) "An Agrarian History of Portugal. Economic Development on the European Frontier, 1000-2000", Brill. Summary. Link . 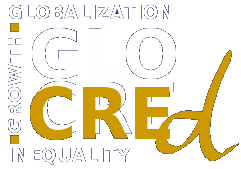 Lains P, Silva E.G (2016) "Globalization, growth and inequality". Antunes C, Fatah-Black K (eds.). Explorations in History and Globalization, Routledge. Link . Lains P (2016) "Agriculture and economic development on the European frontier, 1000-2000". Freire D, Lains P (eds.) . An Agrarian History of Portugal. Economic Development on the European Frontier, 1000-2000, Brill. Link . Lains P (2012) "The burden of backwardness: the limits to economic growth in the European periphery, 1830-1930". Lynch F, Guirao F, Ramirez Perez S.M (eds.). Alan S. Milward and a Century of European Change, Routledge. Link . © 2019 GLOCREd. All rights reserved.